Lichtgewicht. 30% meer zicht t.o.v. ouderwets masker. 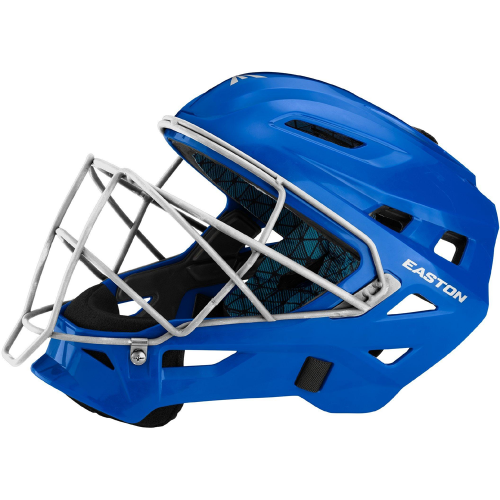 Easton’s® new Gametime™ catcher’s helmet features a solid gloss ABS plastic shell with strategically placed vents for increased airflow, and a steel cage redesigned to give players maximum visibility behind the plate. The comfort stacked foam on the inside of the helmet features a BioDri™ moisture control fabric liner, and the ergonomic chin cup design provides a better fit and allows for improved player communication. The Gametime™ catcher’s helmet features an extra wide rear top strap for secure locked-in adjustment for a better fit, and meets the NOCSAE™ standard for all levels of play.